This page describes techniques and issues with measuring Linux system memory accurately. This is important for embedded systems since usually there is limited memory, and no swap space, available. It is currently (as of 2.4 and 2.6 kernels) very difficult to get an accurate count of used and free memory for the system. Having an accurate count could potentially enable better error handling for out-of-memory conditions, or error avoidance for low-memory conditions, in CE products. Consumer expects mobile phones to be more stable than PC. Mobile phone should not crash or freeze when it accidentally hit the limit of memory. Refrain fro activating new application if current room cannot satisfy it. /proc/meminfo: underestimates room by excluding pages which can shrink. Therefore: we implemented a memory usage API to estimate current room of memory more exactly. Estimates amount of page cache and slabs to be reclaimed by shrink in addition to free pages. Memory Usage API gives a fairly good estimate of memory remaining. A process was run to constantly allocate memory, eventually exhausting the memory of the machine. While this was running, the memory usage API was called to determine the amount of free memory remaining in the machine. The machine had no other activity on it. The amount of memory used by the process and the amount of memory remaining should add up to the total memory on the machine. The diagram shows a pink line (B) indicating the amount of memory used by the test program, a blue line (A) indicating the return value from the memory usage API, and a yellow line (A+B) showing the addition of the two values. The yellow line fluctuates slightly due to some inaccuracies (a race condition with shrink_caches), but overall stays fairly constant. Get the number of shrinkable page cache by inspecting active- and inactive- page cache list, and counting pages that can be free'ed. The inspection logic is basically same as shrink_cache(). The Difference is whether pages are actually free'ed or not. Get the number of pages in slab free list. Get the number of i-node cache and directory entry cache. We do not inspect the status of those caches in detail for saving time. I think this implementation is not mature enough. For example, race condition between kswapd and this API can create some amount of error in the free page count. Here's a patch which adds a new function to determine the "shrinkable" size of memory. This is against a 2.4.x kernel. +  * count shrinkable page count function. + 		 * so the direct writes to the page cannot get lost. + 	   * the page is freeable* so not in use by anybody. Sony has been ported this feature to 2.6.11; See the next section. The Linux kernel provides the ability to view certain pieces of information about system and per-process memory usage. However, the information currently provided is not detailed enough. The feature described here adds some extra memory instrumentation to the kernel, and reports more detailed information about process memory usage, via some new entries in the /proc filesystem. This function utilizes Memory Typed Allocation to handle different type memories with NUMA based thecnology. If you want to port this function to vanilla 2.4/2.6 kernel you should remove this dependancy. How about "/proc/<process id>/smaps" ? It shows the categorized memory usage of each sections of a process. 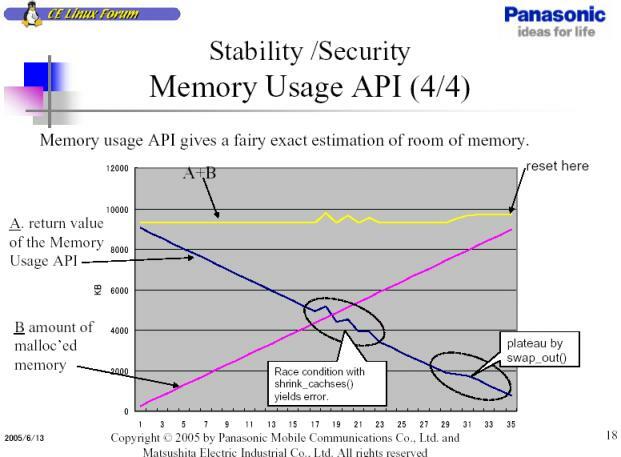 Sony has ported the above features and Panasonic's "accurate memory counting API" mentioned to kernel 2.6.11. We replace new system call introduced by original 2.4 patch from Panasonic, to new /proc interface "/proc/freemem" for better acceptance. /proc/freemem freemem-1.patch Accurate memory counting API, see above. (Code was originally obtained from here There is a .deb file, which I de-archived with 'ar -x', then un-tarred data.tar.gz, and then un-tarred kernel-source-2.6.12.3.tar.bz2 and copied the file security/lowmem.c). * when applications are being stupid. printk(KERN_ERR ": Failure registering with the primary"
printk(KERN_ERR MY_NAME ": Failure unregistering "
Matt Mackall mainlined a new "kpagemap" system in kernel version 2.6.25. This system provides detailed information about all pages used by processes on a system. See the file Documentation/vm/pagemap.txt in the kernel source tree to learn about the /proc interfaces used to obtain information from this system. Matt gave a presentation on this system (before it was merged?) at Embedded Linux Conference 2007. See Matt's presentation for details. is this what you are looking for ? This page was last edited on 4 February 2011, at 17:57.